The 64th and 125th Ohio retire from the woodlot south of the Blacksmith Shop, leaving behind a skirmish line. The 58th Indiana of Buell's brigade attaches to Harker and extends his line west. Kershaw’s Brigade advances toward them, with Humphrey’s Brigade trailing behind it. 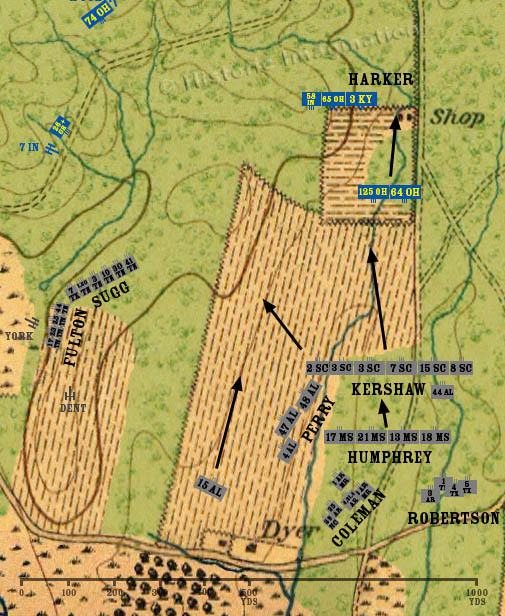 Kershaw sends the 2nd South Carolina far to the left to outflank the Union line. The 15th Alabama continues north, apparently missing Perry’s brigade in the woods to the right. Hood’s Division rallies in the woods.